FOR many of the homeless who drop in to Brisbane’s inner city Blind Eye Centre this is their only sanctuary. The most vulnerable sleep under bridges, huddle in doorways or hide behind building air vents as they wait out the hours of darkness and bitter cold. “It is street survival mode for a lot of these people,” Blind Eye Centre director Roby Curtis said. “They are unable to manage their finances, and often they have done the circuit of boarding houses, and end up saying ‘I would rather be on the streets’. On any morning scores of homeless people arrive at Blind Eye Ministries’ South Brisbane warehouse, which starts with morning prayer led by Mr Curtis. During Homelessness Week, Mr Curtis is acutely aware that visitors to the centre are amongst Brisbane’s most needy. He said about 35 per cent were indigenous. There are also large numbers of New Zealanders. Patrons stay for a meal prepared by volunteers, and spend time “chilling” away from the pressures of the street. There are basic facilities available – a shower, washer and dryer, a pool table, prayer space, computer and access to phone calls. Reaching out to the poor and creating opportunities of Church and community are at the core of the Blind Eye Ministries. “We’re about keeping the Gospel front and centre, through daily prayer, and opening our eyes to the poor – not turning a blind eye,” Mr Curtis said. “Unfortunately with our service we don’t have much to offer in the evening. “The vision for us is to run this centre 24/7 so there is no rough sleeping – a place off the street that is safe. And with a productive pathway off the street. Raised in a Catholic family and within a “Catholic framework”, Mr Curtis said his own life was powerfully transformed when he was 19. He rediscovered his Christian self through a Protestant friend who invited him to church. “I was then able to lay down foundations with a group of young Catholics through an Ignite conference. I met people who were of the same spirit and with the same passion and conviction,” Mr Curtis said. Mr Curtis attended the beatification of Mother Theresa of Kolkata on World Mission Sunday in 2003, and he said he was called in prayer by the Lord on that day. The idea of a grassroots minstry had already taken root, although it took years before the drop-in centre was established in South Brisbane in the shadows of the Go-Between Bridge. “One of the things that I learnt was we needed a place that was home. And that’s why we are here in this place today,” Mr Curtis said. In 2014, for his service to the poor, Mr Curtis was named a finalist in The Catholic Leader’s Community Leader Awards. At that time he told The Catholic Leader: “Faith and deeds are what it means to be a disciple”. Since then, Mr Curtis said Blind Eye Ministries had developed a “strong identity in the community”. “Its profile has grown and the feedback is overwhelming that our service is vital in this part of the city,” he said. “Personally I’m still in my infancy as a young Catholic man working in this field, but I’ve had the opportunity to keep the flame and the passion and the core values of our mission alive. Mr Curtis has extended his ministry to work more closely with indigenous poor. He has recently returned from the Northern Territory where he participated in a youth breakaway camp for young Catholics from remote indigenous communities. 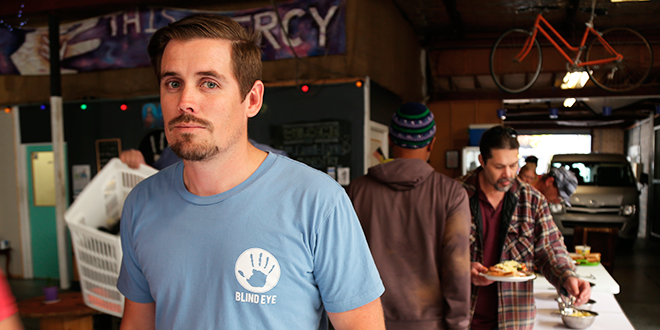 Blind Eye is funded by donations and does not receive government or church funding. To nominate someone like Roby Curtis for The Catholic Leader’s Community Leader awards, complete a nomination at www.theleaders.com.au.